CALBAYOG CITY, Samar – To denounce the alleged political interventions of certain military and police personnel as well as DepEd (Department of Education) employees in connection with the forthcoming SK and ABC Federation Elections, a joint conference of the PCL (Philippine Councilors League) and LMP (League of Municipalities of the Philippines) Samar Chapter was conducted on November 16, 2010 at Calbayog City Cultural Convention Center. Eighteen (18) mayors representing the municipalities of Villareal, Basey, Matuguinao, Sto. Niño, Almagro, Paranas, Catbalogan, Daram, Hinabangan, Tarangnan, Marabut, Pagsanghan, San Jose de Buan, Sta. Rita, San Jorge, Jiabong, Gandara, and Sta. Margarita and 14 PCL officials were present. The move for coming up a joint executive and legislative conference was on the basis of the alleged involvement of a military officer under the name of 2nd Lt. Eduardo R. Mendoza of the 34IB, where an unsigned letter coming from him was distributed to some barangay captains of Paranas directing them to attend a meeting in Brgy. Calapi, Motiong, Samar. The letter was expressly directing them to attend an Orientation Seminar on Integrated Territorial Defense Security System (ITDSS) and to witness some talks initiated by officials of the province on developments projects of the barangay to be given by Congresswoman Milagrosa Tan. Another set of letters came out with the same purpose signed by a certain Sgt. Romeo Paldez of 34IB Alpha Company situated in Poblacion 2, San Jose de Buan, and was also distributed to the barangay captains and the SK officials in San Jose de Buan, Samar. The situation has worsened when San Jorge Mayor Nancy Grey while conducting barangay visitations was being tailed by some policemen led by P/Inspector Cerilo Apiten, Jr. The day after, the same group of personnel escorted the relatives of the different barangay captains convincing them to join with the group of barangay captains who were already “housed or hamleted” in Hotel Maqueda Bay in Catbalogan Samar, through the behest of the Provincial Governor; that on November 6, 2010, some barangay captains of her municipality were also invited to attend a meeting in Catbalogan Samar but were no longer permitted to return home until now and their respective families could not reach or contact them. Furthermore, a certain SSgt. Guillermo Daga of the 52ndIB has allegedly exerted influence over some CAFGUs and threatened them to be relieved from duty by transferring to another area if they refuse to support their SK and ABC candidates in the upcoming elections. In Sta. Rita, teachers whose children are SK officials were also intimidated. The preceding circumstances as manifested by some witnesses became the basis of creating a joint resolution by the PCL and LMP calling the attention of the Department of National Defense, Department of Interior and Local Government and Department of Education to conduct an investigation and inquiry on the alleged partisan activities committed by the military, police and educational personnel in preparation of SK and ABC Elections this December. Prior to the joint conference, Samarnews.com was able to talk with LMP-Samar Chapter President Reynaldo Latorre and PCL President Rogelio Casurao mentioning on the suppose neutrality (afar politician’s maneuver) that the military should execute in effecting security operations in Samar Province. To counteract the alleged “military intrusion” in politics, a reliable source said that Defense Committee Chair Mel Senen Sarmiento sent a text message to MGen. Mario Chan of the 8ID informing him that an investigation over the matter will be conducted and his men will personally appear before the house. Chan allegedly replied through a text message also that he would like to exempt the 34th Battalion commander in the investigation. PASAY CITY – Senator Pia S. Cayetano is calling on the Senate to investigate the alarming increase in the number of cases of Filipinos being victimized by international drug syndicates and used as ‘drug mules,’ most of them women. In a privilege speech delivered on Wednesday, Cayetano said 630 Filipinos are currently detained in prisons facing drug trafficking cases. China has the biggest number with 250 detainees, 75 of whom are already on death row. “What is more disturbing is that majority of the drug mules are women,” added the lady senator, who chairs the Senate Committee on Youth, Women and Family Relations. She noted that women make up 62 percent, or six out of every ten Filipinos detained abroad for drug trafficking. She said drug syndicates have been employing individuals to become drug mules in the guise of recruiting them for legitimate work overseas. Drug mules are used to transport illegal drugs through various means, including handling sealed packages, swallowing the substances or hiding these in their underwear, and even surgically implanting the drug packages in their abdominal cavity or placing these inside the mules’ genitalia. She noted that last month, a Filipina was sentenced to death for drug trafficking by the Yogyakarta’s Lower Court in Indonesia. Also just last week, a Filipina was arrested for carrying almost two kilos of heroin in Guangzhou, China. Citing reports from the Philippine Drug Enforcement Agency (PDEA), she said drug syndicates prefer women drug mules due to leniency in the inspection of women in airports. This in turn makes women prey to the syndicates. Once they get to their destination, however, the victims are left with no choice but to follow the orders of the drug syndicates for fear that they might get harmed, she added. Cayetano is slated to file a resolution directing the appropriate committees of the Senate to investigate, in aid of legislation, the alarming increase in cases of Filipinos, especially women, who are being used as drug mules by international syndicates. CALBAYOG CITY, Samar – The excitement of Pacqiao-Margarito’s fight easily vanished when a fire broke out at 12:35 until 2:40 in the afternoon on November 14, 2010 in Purok 2, Brgy. Aguit-itan, Calbayog City. The narrow streets and pathways in the area made it difficult for the fire fighters to gain access and extinguished the thick burst of flame which lasted for more than 2 hours. Based on CUHD (City Urban Housing Division) record, 269 houses were burned, but other concerned offices have yet to figure out the exact number of victims. BFP (Bureau of Fire Protection) Calbayog continuously conducts investigation on how the fire started and the total cost of damages. The city government immediately provided temporary shelters for the victims although others chose to live with their relatives while the rest opted to stay near the place for fear that they would not be allowed again by the city government to restore their structures. CUHD Chief Cicenio Oquendo identified Western Heights Subdivision in Brgy. Matobato as a suitable relocation site aside from the temporary shelters earlier provided such as island town terminal near the pier site, Jogger’s in Brgy. East Awang, and SK (Sangguniang Kabataan) Hall. SOS Children’s Village in Brgy. Dagum has also agreed to accommodate a number of families to be temporarily transferred. Vice-Mayor Ronald Aquino requested the chairman of Aquit-itan to discourage residents to rebuild their houses in the area as the city government would like to control the “mushroom” of structures that would lead again to another catastrophe. It was found out that there were concrete structures built in the vicinity owned by Aguit-itan based inhabitants and car-line or island town locals managing businesses in Calbayog. Aquino stressed during the CDCC (City Disaster Coordinating Council) meeting Monday morning that Calbayognons should be given priority in terms of relocation sites and other assistance. The urgent need to resolve this crisis has led the CDCC to seek help from the private sectors for food, clothing and cash donations which should be given directly to the Community Affairs Office and the City Social Welfare and Development Office. Finally, Aquino acknowledged the assistance extended by Catbalogan Filipino-Chinese volunteers; Gandara and Sta. Margarita BFP, ATO Calbayog and Tinambacan BFP Sub-station. The National Democratic Front-Eastern Visayas today condemned the massacre of a prominent botanist and his two assistants last Nov. 15, and pinned responsibility on the 19th IB, calling for its expulsion from the region for committing mass killings and other human rights violations for so many years. "The NDF-EV condoles with the families and friends of University of the Philippines professor Dr. Leonardo Co and his assistants, Sofronio Cortez and Julius Borromeo, who were indiscriminately fired upon and killed by 19th IB elements while doing fieldwork in Kananga, Leyte," said Fr. Santiago Salas, NDF-EV spokesperson. "We join the call for justice for Dr. Co and his assistants, as well as for survivors Policarpio Batute and Ronino Gibe, and the many other victims of the 19th IB. The NDF-EV does not believe that an encounter occurred between the New People's Army and the 19th IB elements and that Dr. Co's group was caught in the crossfire. It is highly improbable for Dr. Co and his companions to accidentally stray near an NPA camp or an NPA unit on maneuvers and suddenly find themselves in a crossfire. The NPA camps are well-hidden and highly secure areas inaccessible to most, and an NPA unit on maneuvers also stays away from civilians to maintain secrecy and to avoid endangering them. Rather, it is the NDF-EV's belief that Dr. Co's group was mistaken for an NPA unit by the 19th IB elements led by Lt. Ronald Ocheamar, who attacked based on a flimsy intelligence report, and who furthermore violated the rules of engagement by indiscriminately firing without verifying their targets. We trust that the NPA's Mt. Amandewin Command in Leyte is investigating this grave incident to clarify what really happened and to help attain justice for the victims." Fr. Salas also said that the onus is on the 19th IB, dubbing it the "Massacre Battalion" for its involvement in at least three previous massacres and other rights violations. "If confirmed, the killing of the UP professor and his assistants will be the second massacre in Kananga alone by the 19th IB. 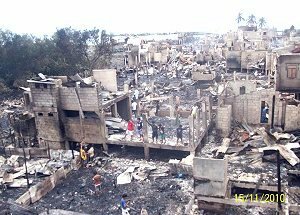 To remember, the first Kananga massacre happened on April 16, 2003, with the mass torture and massacre of nine civilians – including a pregnant woman and four minors. The victims were doused with boiling water before being shot in the head at close range. Moreover, on Nov. 21 will be the commemoration of another 19th IB massacre, this time of ten peasants in Palo, Leyte in 2005 who were peacefully working when attacked. Meanwhile, the earliest documented massacre by the 19th IB involved the killing of the Nuguit family – three children, the father, and the mother who was also pregnant – whose house was strafed in Palapag, Northern Samar on January 28, 1999. The 19th IB is also accused of other rights violations, such as the extrajudicial executions under Oplan Bantay Laya that victimized progressive activists, as well as CPP-NPA cadres Bibiano Rentillosa and Antonio Ramos, who were killed after being captured alive in 2006 and 2007, respectively." The NDF-EV spokesperson called on the Aquino government not to whitewash but to swiftly investigate the incident and render justice to the victims, and to take steps to end the brutal militarization of Eastern Visayas that led to the massacre. "We call on Justice Secretary Leila de Lima as well as the human rights committees in the Senate and Congress to probe and punish the responsible for this latest atrocity by the 19th IB as well as previous ones, so justice can finally be rendered to the battalion's various victims. The survivors and potential witnesses Policarpio Batute and Ronino Gibe must also be protected from retaliation and whitewash attempts by the 8th Infantry Division. This latest atrocity should also be a wake-up call to the Aquino government to end Oplan Bantay Laya now and to desist from crafting more military campaigns that mostly harm civilians. Eastern Visayas is in the throes of massive militarization because it is a priority area for the government campaign against the NPA. But as this new Kananga massacre shows, the government campaign is turning into senseless violence against the people because trigger-happy soldiers have been enjoying impunity for too long, despite so many complaints over human rights violations." Fr. Salas also called on the peace negotiating panels of the Aquino government and the NDFP to take the Kananga incident as a challenge to persevere with the peace talks. "The senseless deaths of Dr. Leonardo Co and his two assistants epitomize the sufferings of innocent civilians and the crying need for peace and justice, in the face of government offensives that wantonly violate human rights and international humanitarian law. The NDF-EV hopes that the recent tragedy will spur the Aquino government into showing its political will for negotiations, rather than pursuing the militarist and fascist approach of Oplan Bantay Laya over the past decade." CAMP LUKBAN, Catbalogan, Samar – 333 new Privates of the Army’s 8th Infantry Division faced the people from all walks of life who witnessed their graduation rites in the hollow ground of the Division Headquarters, yesterday morning, November 16. 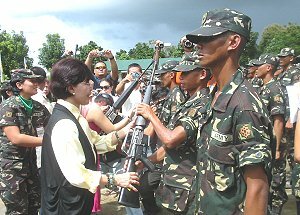 Leyte Vice-governor Mimyet Bagulaya handed over an M16 armalite rifle to a new enlisted private during the ceremonial entrustment of firearms at the 8ID grounds. Parents, relatives, friends and people from different sector, young and old assembled around the ground not wasting their opportunity to witness such a historic event where their love one is involved. Everyone fulfilled their expectation as they saw the graduating class march, execute rifles and performs traditional Filipino martial arts and self-defense pose almost perfectly. The heavy downpour of rains in the midst of the program did not stop the parade even when the 8ID marching band demonstrated their exhibition that fully added colors to the activity. Spectators bid satisfaction to their faces as the band completed their show with a pass-in-review. Significant to the activity is the ceremonial entrustment of firearms to the newly enlisted privates done by the representatives from the people of all walks of life. It was spearheaded by Vice-Governor Ma. Mimietta Bagulaya of Leyte representing Governor Jericho Petilla, as the ceremony’s guest of honor and speaker. Farmers, vendors, fisher folk, nurse, doctor, student, parents, lawyer, NGO, GO and media were some of the few who made themselves available to entrust fire arms to the soldiers. This symbolizes that these people entrust their protection of rights, security and safety to the soldiers whom their primary duties and responsibility is to defend the constitution. In a statement made by Major General Mario Chan, chief of the Army in Eastern Visayas, he said that the new breed of soldiers will be an additional force to secure the people of Region 8 against the people who vehemently destroy and violate our people’s rights. “With the additional forces, the 8ID will surely perform its tasks of protecting our people’s right against the rebels who violently destroy its sanctity. With these reasonable forces that adds to the 8ID troopers, rest assure that our people can expect more than what we are doing for the sake of peace and development in this part of the country,” General Chan says. Meanwhile, Vice-Governor Bagulaya said in her message that the men and women of the 8th Infantry Division have continuously contributed devotion to duty according to constitution. “With these additional forces to the 8ID, I am optimistic that our problems against insurgency will surely come into end. That’s why all members of the society, government and non-government agencies should give their share for the ultimate attainment of peace not only in Samar but also in Leyte provinces,” says Vice-Governor Bagulaya. In the end, the ceremonial entrustment to the newly enlisted privates gave more hope for the people of Region 8 to once again re-experience the peaceful environment that they long experienced before the advent of the terrorist communist in their provinces. Cayetano said the death of Leonardo Co, a University of the Philippines-trained botanist known for his work in helping communities identify and classify herbal medicinal plants in their locality, is not only a loss to the scientific community, but also to the environment as well as the field of traditional herbal medicine. “I am saddened by the loss of Leonardo Co who personifies what we may call as ‘people’s scientists.’ His role in the community may have been low-key and perhaps often unnoticed, but it has brought invaluable help to our people in developing their knowledge and skill on traditional herbal medicines,” said Cayetano, Chairperson of the Senate Committee on health and Demography. At the same time, the lady senator called for an independent investigation into Co’s death and the two forest guards who were with him when the encounter happened. Co’s team was reportedly in the Kananga forests conducting a study on tree biodiversity and collecting seedling specimens of wild trees for replanting as part of his work as biodiversity consultant of the Energy Development Corp. (EDC). Finally, Cayetano called on the government to provide sufficient security for scientists and foresters doing field work in far-flung provinces, especially those known to be areas of conflict between government troops and armed rebel groups. She made a similar appeal on behalf of medical professionals doing volunteer work in rural areas after a volunteer nurse was raped and maimed by still unidentified perpetrators in South Upi, Maguindanao last September. PALO, Leyte – Palo Mayor Remedios ‘Matin’ Petilla was all praises to the senior corporate officials of Innovaland Sales and Marketing after the latter paid her a courtesy visit and informed her that Innovaland Realty and Prime Peak Properties will soon start a construction of a condominium development at Brgy. Candahug, this municipality. Innovaland, one of the fastest growing real estate companies in the country, said that it already forged into an agreement contract with RBC Distributors, Inc. owned by Romeo Carbonel based in Tacloban City which includes a condominium development in a 3-hectare lot owned by the latter located near the boundary of Tacloban and Palo facing the Leyte Gulf. Shionel Gesite, general manager of Innovaland, said that the development worth P1Billion will include 6 buildings of 7-storey each enough to house 420 condo units. “This is going to be the first in Region 8 and the construction will start soon,” Gesite said who is a native of Balangkayan, Eastern Samar. “I am glad that Mayor Petilla warmly welcomed us,” he continued. Mayor Petilla said that she is glad that Innovaland has considered her town to be the host of one of its expansion projects. The municipality currently is the primary choice of real estate developers for housing ventures because of its large raw lands ideal for improvement. Among those that made into this town are the Vista Land and other locally based real estate developers. Glorisimo Pionilla, President and Chief Executive Officer of Innovaland, said that basically, business expansions of his company is challenged by the inability of the majority of Filipinos to own house and lot in their own country. “Owning house and lot here is basically unaffordable and inaccessible,” Pionilla expressed in a message. Poverty, according to him, has been the primary culprit of the fate of the many Filipinos. “That is why we innovate ways so that every Filipino family will have their own house and lot,” Pionilla said. 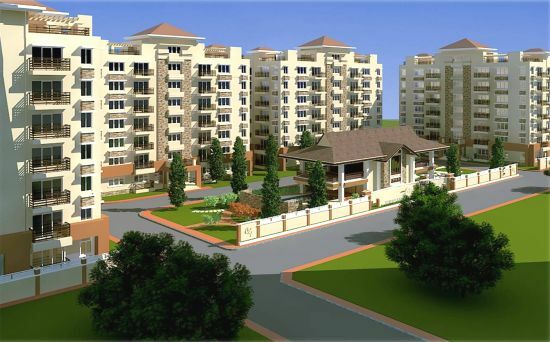 The company’s recent developments were focused on low to medium-cost housing units. It started going into realty in 2003 and has since built various ambitious projects in Baguio, Tagaytay, Cavite, Pampanga, Bulacan and Antipolo. Pionilla added that aside from real estate, it now has ventured into consumer products direct selling business to practically provide entrepreneurial ventures to many Filipinos paving a way for them to own decent housing units. Gesite said that the company has so far developed health products for sale and more will be included in the product list before the year ends. These will be available to anybody who wants to go into business for a minimal investment. For inquiries and free product presentation, just call or text 0926-573-3611. “We want to empower every Filipino so that real properties will not just be for the rich and the famous but to every ordinary citizen including the people belonging to the marginalized sector of the society,” Pionilla said. Meanwhile, Petilla expressed that other than housing priorities, also included among the crucial concerns of her administration is the absence of a decent memorial park in her jurisdiction. Although plans for developing a park are underway, Innovaland said it will consider the intention of the former governor and congresswoman. “We will look into the possibilities as we want to live up to our name which comes from the word ‘innovate,’ Gesite said.